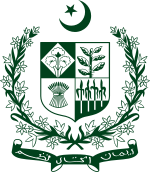 The Ministry of Maritime Affairs (Urdu: وزارت بحری امور‎) which was formerly known as the Ministry of Ports and Shipping (renamed in October 2017) is a Federal Ministry of the Government of Pakistan. The current Minister for Maritime Affairs is Ali Haider Zaidi and the current Federal Secretary for Maritime Affairs is Rizwan Ahmed. The Ministry is headquartered in Islamabad and its main attached departments are in the port city of Karachi. The Ministry is headed by the Maritime Secretary of Pakistan. Keeping in view its close links with the seaports, a division of the Ministry of Maritime Affairs is established in Karachi which includes a number of wings and attached departments each headed by a high-grade civil servant or bureaucrat. Before 2004, Ports and Shipping was a subject and part of the Ministry of Communications. In 2004, the Ministry of Ports and Shipping emerged as a separate and independent Federal Ministry of the Government of Pakistan. In October 2017, the Ministry was again restructured and renamed as Ministry of Maritime Affairs. The Ministry officials look over the administrative and policy matters of the Federal Ministry including policies, procedures, rules and regulations. Apart from that, the attached wings and departments established in Karachi deal with their respective domains under the administration of the Federal Ministry of Maritime Affairs. ^ "Ports,Shipping renamed as Ministry of Maritime Affairs". Pakobserver.net. 11 October 2017. Retrieved 24 February 2019. ^ "Chief of the Naval Staff, Admiral Zafar Mahmood Abbasi exchanging views with Minister for Maritime Affairs, Syed Ali Haider Zaidi at Naval Headquarters. APP". Photo.app.com.pk. Retrieved 24 February 2019. ^ "Rizwan new secretary maritime affairs". The Nation. 2 April 2019. Retrieved 3 April 2019. ^ "Federal Minister for Maritime Affairs Mir Hasil Khan Bizenjo called on Federal Minister for Defence Engr. Khurram Dastgir Khan at Ministry of Defence. APP". Photo.app.com.pk. Retrieved 24 February 2019. ^ Arshad, M. "Ports Ministry to develop mechanism for coal supply to IPPs".